In his presentation “No Is Short for Next Opportunity,” Martin Limbeck does not mince his words. Whiners, bureaucrats, and “that’s not going to fly around here” kind of people have always turned him off. Provocative, polarizing, motivating: He gets right to the point and says what he thinks and lives by what he teaches. Studding his presentation with anecdotes from his own career, he proves that the path to the sales summit is paved with discipline, ambition, and the absolute will to succeed. With no regrets, he speaks candidly of the failures, bad breaks, and mishaps that have come his way. He makes clear that setbacks are learning successes and drive you to work on yourself, true to the motto “What doesn’t kill you makes you stronger.” The keynote speaker conveys to his audiences how with the right mindset they can acquire the skills of the best sales professionals and set the course for sales success. Martin Limbeck doesn’t simply give tips—he provides recipes for success: gained in the field to be used in the field. Active prospecting and customer acquisition are indispensable if companies want their products to thrive long-term in a fiercely competitive market. With keynote speaker Martin Limbeck, you will discover in practical terms how to implement a variety of prospecting methods according to your company’s strategic policy, and how to exploit the results in a strategic and targeted fashion. Limbeck openly explains why it is instrumental to your success that when planning your prospecting you consider who in your company will be in charge of maintaining the relationship with the new customers. Selling Means You Must Sell! From negotiating your price to consistently closing your deals—guaranteed! From prospecting to the initial contact, the first meeting, the right approach to objection handling, the closing question and even the after-sales service: In his presentation “Best-in-Class German Sales Engineering,” keynote speaker Martin Limbeck addresses the salient aspects of the sales process. No stone is left unturned—and this thoroughbred sales professional has a solution ready for every obstacle in the way. He illustrates vividly and convincingly what sets a top seller apart from an average one. 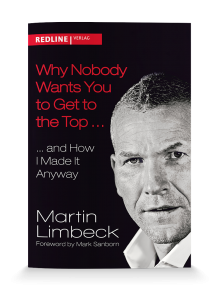 Martin Limbeck knows precisely what successful employees need to work on and what makes the difference when the stakes are high. How to reach heavyweight sales figures: Sales expert and occasional boxer Martin Limbeck offers numerous tips and strategies on how to set yourself apart from the pack and secure your world championship belt in sales. He clearly shows how in both sales and boxing, it comes down to one thing: the right mindset. After all, the victory lies not in your fists but between your ears. Either the market is driving you or you are driving the market: Nowadays in sales it is a question of being number one in the mind of your client. When it comes to your sales success and competitiveness, the perception of your products, performance, and skills is equally important. In this presentation, the keynote speaker Martin Limbeck explains how you go about setting yourself apart from the crowd, so that you are viewed not “simply” as a salesperson but as a distinctive brand and can be distinguished from your competitors over the long term. Don’t turn your sales team into accountants and Excel artists! As a sales manager, it is your task to lead by example and do that which you expect of your employees. Do you want everyone to establish ten new prospects a day? Then you too will have to grab the phone and get busy. As the boss, your function as role model is one that you must earn. In his presentation “The Most Effective Style of Leadership” Martin Limbeck explains why human resources development is the paramount task for a leader and provides invaluable tips on how to promote the development of your sales team and turn your employees into motivated, optimistic, and above all inspired sales professionals. Why Nobody Wants You to Get to the Top . . . If it’s easy, anyone can do it—only obstacles make you stronger. Sound like a contradiction? Not according to Martin Limbeck, and he should know. In what is perhaps his most personal presentation, “Why Nobody Wants You to Get to the Top … and How You Can Make It Anyway,” the keynote speaker draws on his own career to show what it means never to give in and to keep fighting in the face of countless hurdles. His message here is: If life says “no” to you, it simply means that you have not YET reached the finish line. Often it is only a small step that separates you from your next goal. In this presentation, Martin Limbeck will reveal to you how he managed to motivate himself time after time, and how you too can make more out of your life in spite of all adversity. Would you like to book a presentation with Martin Limbeck? Then get in touch with us. We look forward to talking with you.